The Mission Mode of Mario Kart DS uses several locations for its Boss Battles, some of which were created for the Mission Mode and are not found anywhere else. Please note that the arenas exclusive to the Mission Mode of Mario Kart DS are not named, and thus, the names used for them here are conjectural. The Water Arena is where both Big Bully and Chief Chilly are fought. The Arena consists of a platform surrounded by water. There are no boundaries, allowing both the player and the boss to be knocked in the water. The background of this stage bears some resemblances to the interior of a Fortress in Super Mario Bros. 3. A few waterfalls and Wood Blocks are also present. There are four Item Boxes in the Chief Chilly battle, compared to one in the Big Bully battle. When battling Chief Chilly, the arena is slightly bigger. Big Bully, the Level 1 boss. Chief Chilly, the Level 6 boss. The Sand Arena is where both Eyerok and King Bob-omb are fought. Much like the Water Arena, it is completely featureless. However, unlike the Water Arena, there are boundaries, meaning that the player and the boss can't be knocked off-stage. The background of this stage is based on the interior of the pyramid in Shifting Sand Land. Eyerok, the Level 2 boss. Big Bob-omb, the Level 5 boss. King Boo, the Level 4 boss. The Lava Arena is where King Boo is fought. The arena consists of a platform above a pit of lava. The platform is a lot bigger than the Water and Sand arenas, but it has quite a few holes in it, which may result in falling into lava. The background also has the Wood Blocks and falls from the Water Arena, except the waterfalls are now lavafalls. Unlike the first and most battles, the player will need to collect 50 coins while avoiding King Boo. Coins are scattered across the platform. Goomboss, the Level 3 boss. This is where Goomboss is fought. It is completely identical to the race course version. 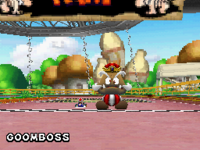 However, in this version there are three laps instead of five, Goomboss throws Goombas on the track and Goomboss gets bigger when entering the next lap. Goomboss also throws Mushrooms sometimes, which bear a slight resemblance to Goombas from a distant viewpoint. Goomboss also cheats on the last lap and hops over the center of the divider. Wiggler, the Level 7 boss. This is where Wiggler is fought. It is completely identical to the race course version, except that Wiggler often knocks out passing cars, slightly changing the course. The Item Boxes will all contain Stars. If the player bumps a car or truck while powered-up with a star, they will earn a Dash Mushroom. This page was last edited on March 14, 2019, at 20:47.